The setup process for Enterprise Keyboard can vary by device, and activation is sometimes necessary to make it available to users. Zebra's keyboard also can be set as the default input method, if desired. This section of the guide covers manual activation of Enterprise Keyboard and the steps required for setting it as the default input device. For advanced settings, such as language selection and scan-tab configuration, please see the [Customize section](../settings). The section covers direct activation of Enterprise Keyboard on a single device. If using one of the remote methods referenced above to activate and configure multiple managed devices, please see the Automated Activation section later in this guide. 1. Bring up the Android keyboard and long-press the spacebar. If the Enterprise Keyboard does not appear, proceed to the steps below. 3. 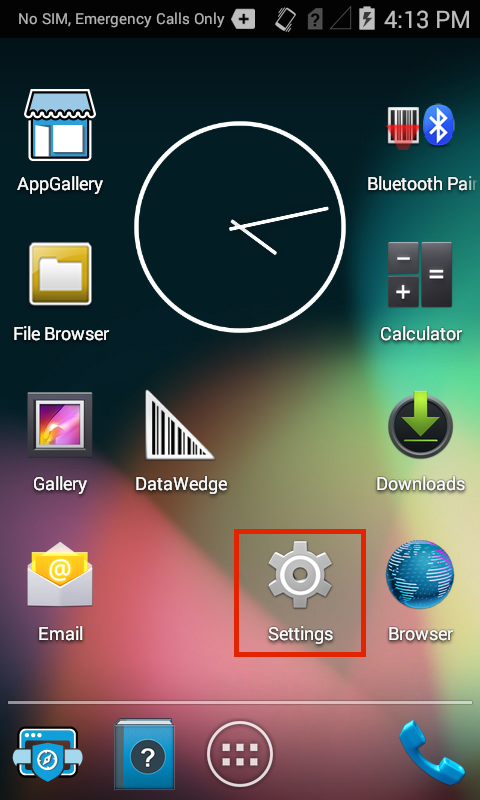 Place a check next to "Enterprise Keyboard" to enable it on the device. Uncheck other input devices to disable them, if desired. If Enterprise Keyboard was included with the device by default (and not downloaded as an OS patch), this step might not be necessary. 5. Tap the Enterprise Keyboard radio button to set it as default input device: Note: This panel also can be invoked by long-pressing the spacebar whenever the Android or Zebra keyboard is visible. 6. 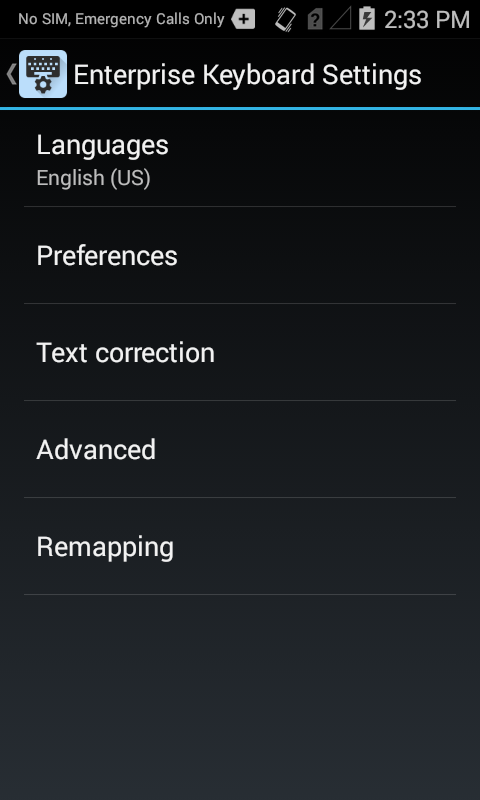 Tap the HOME key to exit the Settings panel. Enterprise Keyboard is now ready to use with default settings. 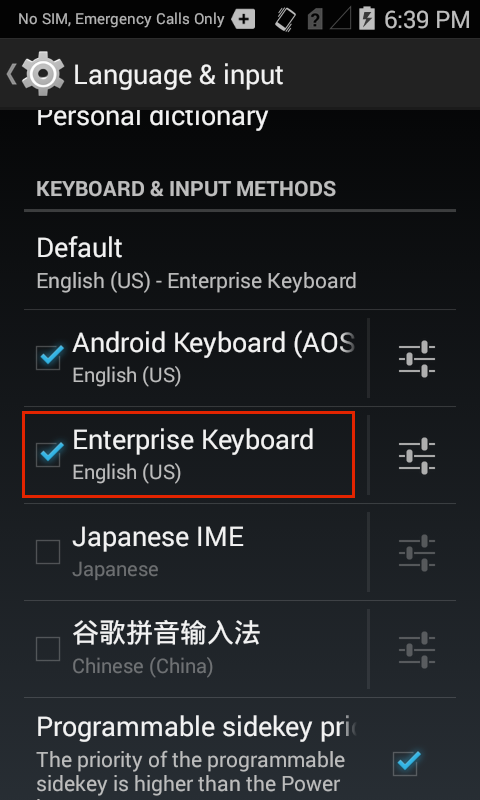 Following installation, Enterprise Keyboard settings can be changed through the Android Settings panel. 4. On the Enterprise Keyboard Preferences panel, tap the setting(s) that require change: See the Customize section for more information about Enterprise Keyboard settings. Enterprise Keyboard 1.1 (and higher) can be configured remotely on multiple managed devices using Zebra's StageNow tools and the UI Manager service or an organization's own MDM system. Configuration also can be handled programmatically through Zebra's EMDK for Android software development kit. Whether using the UI Manager service through Zebra's StageNow or EMDK tools, or if deploying Enterprise Keyboard from a company's own MDM, it is necessary to specify Enterprise Keyboard's package and class names to select it as the default keyboard on the device. For additional information about usage and syntax, please refer to respective documentation. Enterprise Keyboard cannot be removed if it was included with the device operating system. However, it can be deactivated by reversing the activation process described in the Activation section. 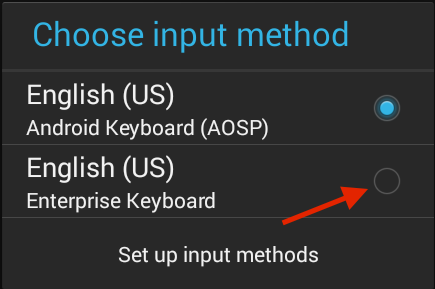 The steps below describe how to deactivate Enterprise Keyboard using the Android Settings panel. Warning: This action renders Enterprise Keyboard inaccessible, including its scanning and other capabilities. 3. 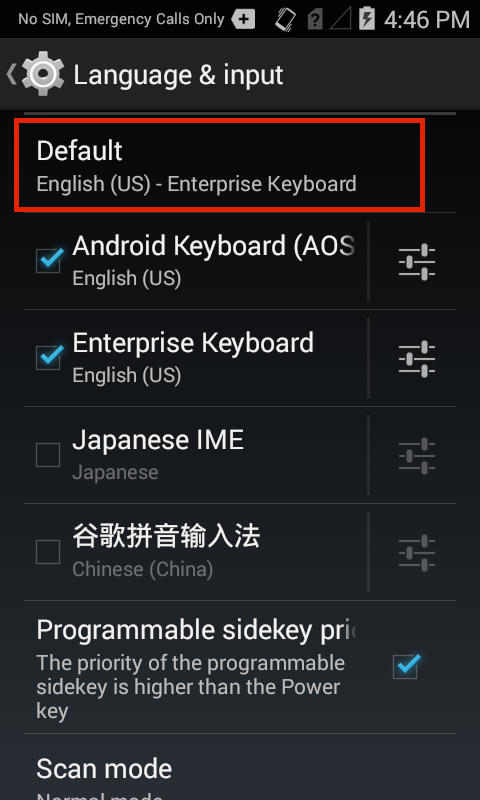 Remove the check next to "Enterprise Keyboard" to disable it on the device. 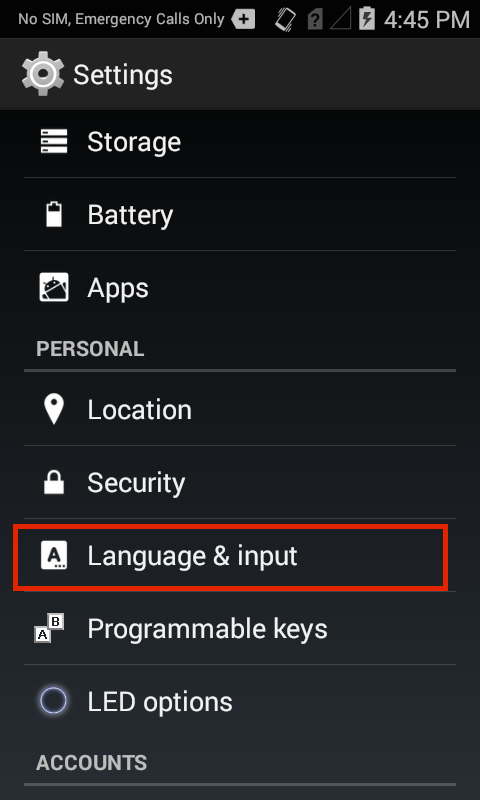 If the Android keyboard is the only other input device, it automatically becomes the default input device and cannot be disabled. Manual deactivation of Enterprise Keyboard is complete. Enterprise Keyboard 1.1 (and higher) can be deactivated on multiple managed devices using an organization's own MDM server in the same way as other Android apps. Alternatively, remote uninstallation can be accomplished through Zebra's EMDK or StageNow tools using the App Manager service.